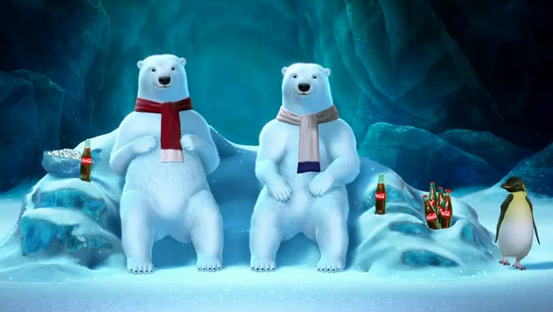 The 2012 Coca-Cola Super Bowl Ad will bring back the cute and funny polar bears according to USA Today. A full announcement of the Coke Super Bowl Ad is expected today. The computer animated polar bears will also appear on Facebook during the Super Bowl XLVI game. The Coca Cola Polar Bears are hosting a live game day watching party. That sounds pretty fun. The bears will be watching the game and chatting with friends from kick off until the clock runs out. You can RSVP now to hang out and chat with the Polar Bears during the game. Plus, with each RSVP Coca-Cola will donate $1 to World Wildlife Fund to help polar bears and their Arctic home. Coca-Cola released the full details about their awesome multi-channel Coca-Cola Super Bowl 2012 ads and social events. Watch three teaser videos with staring the Coca-Cola Polar Bears below.